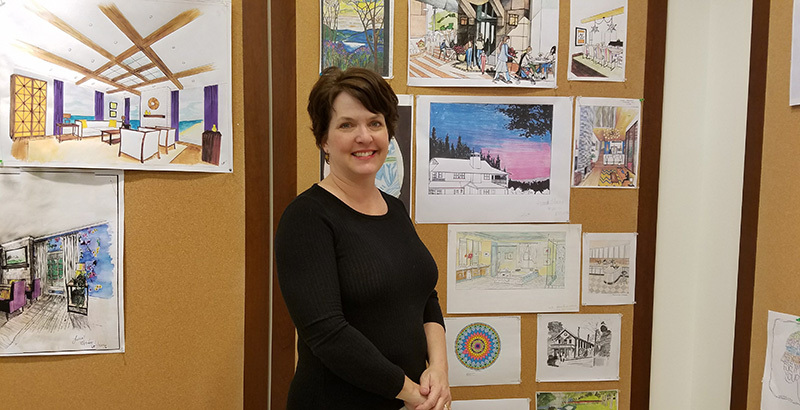 Walk into Jennifer Hopkins’ classroom at Tidewater Community College’s Chesapeake Campus, and you’ll see students actively listening to a lecture, drawing room schematics with colored pencil or designing a floorplan using AutoCAD software. Hopkins is the only full-time faculty member for TCC’s interior design program and head of the department. She joined the college in 2009. A professional architect, Hopkins brings more than 30 years of industry experience to the classroom. Her resume includes work with architecture firms, interior design businesses, engineering firms and as a self-employed designer. “Because I’ve worked on pretty much every conceivable type of project, I can share experiences and lessons learned with students. I can help them think about how to use resources and work with contractors and architects,” she said. Hopkins said teaching comes naturally to her as an avid communicator who enjoys speaking in front of client groups. TCC’s interior design student population has grown every semester except one during Hopkins’ time as program head. Hopkins is the faculty advisor for the student chapter of American Society of Interior Designers (ASID), helping to provide portfolio-building activities for students. “Every project brings new challenges, and you have to have the know-how to find out what you don’t know and use your resources,” she said. In her free time, Hopkins enjoys working out, watching “Survivor” and spending time with family. Hopkins volunteers with Grassfield High School chorus, raises funds for a local dance team and is active in St. Stephens Catholic Church. Hopkins and her husband, Bill, reside in Chesapeake.